Heat a splash of olive oil in a frying pan, dice the onion and sweat down in a pan without colour, add the chopped sage, tarragon and shredded apricot. Drain and leave to cool. Place the sausage meat into a bowl with the onion mix and pistachios, dice the smoked chicken into 1 cm size pieces add to the sausage meat, season and stir well, until all ingredients are combined. Place mixture into a piping bag. Lay the pastry out and pipe a long straight line of sausage meat across the sheet. Brush one edge with the beaten egg and fold the other side of pastry over onto the egg washed edge. Press down to seal with a fork & trim any excess pastry leave in the fridge to chill for 1 hour. 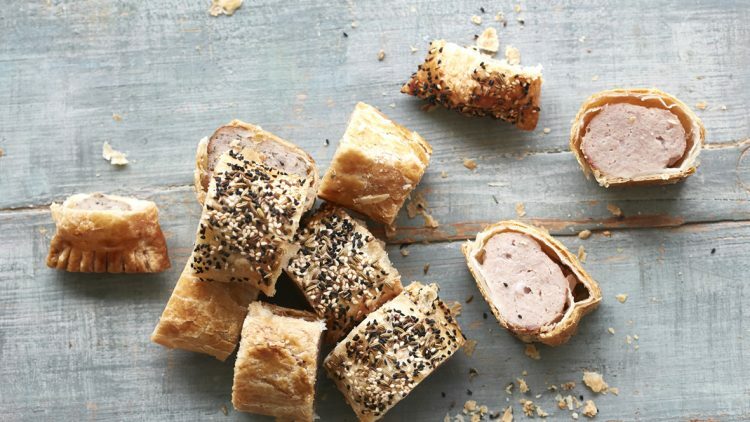 Brush with egg wash, sprinkle with a little Maldon sea salt and the thyme leaves and then cut into six smaller sausage rolls. Place on a baking tray and bake in the oven at 190° for 18 mins or until crisp and golden brown and the sausage meat is completely cooked through.